The term New Product Development (NPD) is generally used to discuss the complete process of introducing a new product in the market. Product can be in terms of a tangible product or an intangible service. 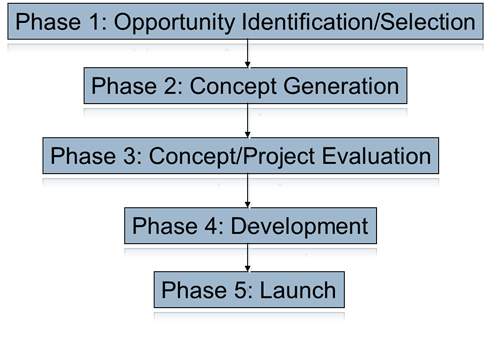 To create the next product in a company’s product line Product Development team goes through development process steps. Starting with a product idea, moves through several phases to generate all the details and documents required to get the product manufactured. A New product development (NPD) process goes through the new risks, uncertainties and often additional information is documented and shared with manufacturing. Dr. Robert G. Cooper is the creator of the world-famous Stage-Gate® process, and was named the “World’s Top Innovation Management Scholar” by the prestigious U.S. Journal of Product Innovation Management and winner of the best seminar leader of the year at Sweden’s Chalmers Institute in Goteborg. He has combined practical consulting with ground-breaking research for many years. Besides his best-selling books “Winning at New Products” and “Portfolio Management for New Products”, he has published more than 100 articles on R&D and innovation management. Dr. Cooper is Professor Emeritus at McMaster University in Canada and ISBM Distinguished Research Fellow at Pennsylvania State University in the USA. He is also President of the Product Development Institute offering innovation know-how and support around the world. Many companies in North America, Europe and Asia have introduced his methods, including 3M, ABB, BASF, Bosch-Siemens, Carlsberg, Caterpillar, Dow Chemical, DuPont, Exxon Chemicals, HP, ITT, L.M. Ericsson, Lego, Procter & Gamble, and Swarovski. Idea generation is the continuous and methodical quest for new product opportunities, including updating or altering an existing product. Idea screening takes the less attractive, infeasible and unwanted product ideas out of the running. Concept development and testing is vital. The idea, or product concept at this point, must be tested on a true customer base. Market strategy/business analysis is comprised of 4P's, which are product, price, promotion and placement. Test marketing, the goal of this stage is to validate the entire concept from marketing angle and message to packaging to advertising to distribution. Market entry/commercialization is the stage in which the product is introduced to the target market. The New Product Development Professional (NPDP) certification, developed and offered by the Product Development and Management Association (PDMA), is an internationally recognized body of knowledge. It offers extensive training on new product development & best practices. It provides a common language, principles and best practices that enable sharing and communication with other New Product Development professionals worldwide. When you earn your NPDP certification, companies looking to hire the best of the best will see your commitment to the profession; know you have top-notch product development and management ability and a track record of professionalism and success. Product development managers are in charge of the analysis and application of products to the general consumer market. Product development managers typically are host to an collection of creative work-flows, thought processes and application systems. They are also expected to be capable of market analysis at high levels and to demonstrate mastery of critical thought processes. While Product Development Managers do not often become VPs of Product Development, the job pays $151K per year on average. Product Development Managers moving up in their careers tend to step into positions as Product Development Directors or Senior Product Managers. The median pay checks in those roles are $39K higher and $44K higher, respectively. PDMA-India is the Indian Affiliate of PDMA, USA located at Chennai. The Product Development and Management Association (PDMA) is the premier global advocate for product development and management professionals. PDMA-India’s mission is to provide a platform for the product development community to learn and share product development best practices through events such as seminars, webinars, special programs and conferences. It will also conduct preparation courses for the product development professionals to attain the New Product Development Professional (NPDP) credential. The Product Development and Management Association (PDMA) is a community of more than 2,000 members whose skills, expertise and experience power the most recognized and respected innovative companies in the world. PDMA's members include product development and management practitioners, academics and service providers in a variety of industries and knowledge areas, including new product process, strategy innovation, market research, tools & metrics, organizational issues and portfolio management. Since 1976, PDMA is the only organization that focuses on the unique set of integrated activities involved in the full lifecycle of product development and management, including innovation.